Bengaluru Bulls are fifth in Zone B with 44 points from 19 matches. Dabang Delhi have no hope of making it to the playoffs but Bengaluru Bulls still retain a chance. Bengaluru Bulls emerged winners in the clash of bottom-placed teams as they beat Dabang Delhi 35-32 in the Vivo Pro Kabaddi Season 5 on Wednesday. Rohit Kumar (12 points) and Ajay Kumar (10 points) led Bengaluru Bulls' charge as they combined to score 22 raid points. Rohit Balliyan scored 11 points but was let down by his team's defence as they scored just six tackle points. This was Dabang Delhi's 15th loss of the season as their dismal campaign continued. Dabang Delhi are bottom of the table in Zone A with 37 points from 21 matches. Ajay Kumar got Bengaluru Bulls a 3-1 lead after three minutes as he scored two raid points. Dabang Delhi scored four points in the next few minutes to take 5-3 lead. Ajay Kumar scored with a two-point raid in the ninth minute as Bengaluru Bulls leveled the match at 6-6. Rohit Balliyan and R Sriram did the bulk of raiding for Dabang Delhi and made it 8-6 in the 10th minute. In the next 10 minutes, Bengaluru Bulls dominated the proceedings. They inflicted an all out in the 17th minute to lead 12-9. Bengaluru Bulls led 17-9 at the end of the first half with Rohit Kumar and Ajay Kumar combining to score 11 raid points. Rohit Balliyan scored with a super raid in the 24th minute as Dabang Delhi trailed 14-20. Bengaluru Bulls scored four points in five minutes as Bengaluru Bulls led 24-15 in the 30th minute. 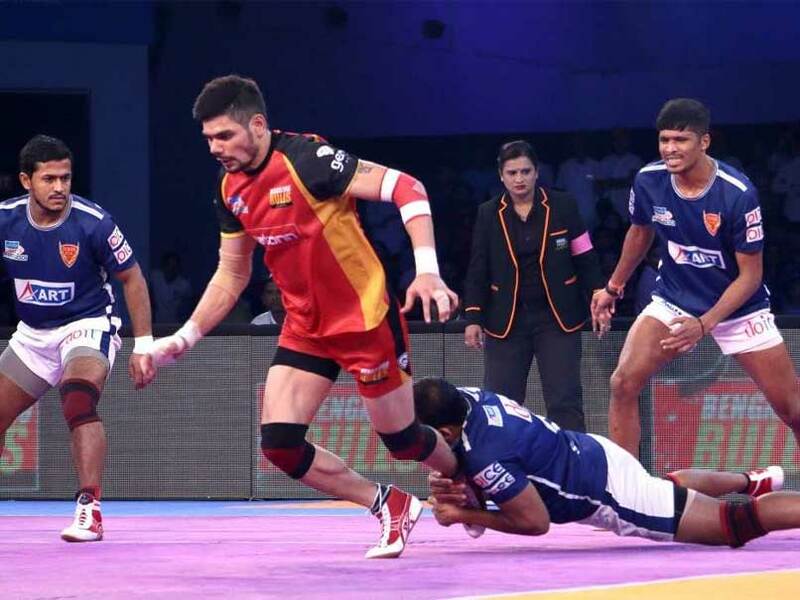 Rohit Kumar achieved a super 10 in the 33rd minute as Bengaluru Bulls led 28-21. 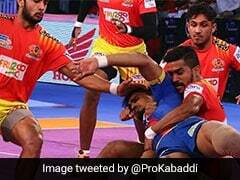 Dabang Delhi inflicted an all out in the 36th minute as they trailed 27-30. Rohit Kumar thwarted any hopes of a Delhi comeback in the next minute as he came up with a two-point raid to give Bengaluru Bulls 32-27 lead. Ravinder Pahal achieved a high five for Bengaluru Bulls in the 39th minute as Bengaluru Bulls 34-28. Dabang Delhi scored four points in the last minute but just fell short as they lost 32-35.